You have 1 Movie in your shopping cart. Info: Just put the movies into the shopping cart. Secure Payment with PayPal or WorldPay. After successful paying you will receive a download-link that is valid for 24 hours. Content: The program was established to explore the technical and economic feasibility of using nuclear explosions for civilian applications. Plowshare started with great expectations and high hopes. Between 1961 and 1973, 27 nuclear explosive Plowshare tests were conducted. Possible excavation applications included: canals, harbours, highway and railroad cuts through mountains, construction of dams. Among them Sedan, a crater excavation experiment with a yield of 104 kt. Under the pressure of economical and environmental concerns the Plowhare Program was discontinued at 1975. Content: 1948: The Sandstone test series introduced a second generation of weapon design by evaluating several new design principles. In addition a number of design parameters were varied to evaluate their effects on performance. The original Fat Man pit design used a Christy solid plutonium core, surrounded by a close fitting natural uranium tamper. The Sandstone devices all replaced the contiguous tamper-core approach with a "levitated core" in which the core was suspended within a larger hollow space within the tamper so that a gap existed between them. The collision between the tamper and core would create more efficient compression of the core than the explosive-driven shock in the wartime design. They apparently retained a solid core however. These devices also abandoned the use of a pure plutonium core since oralloy (uranium highly enriched in U-235) production exceeded plutonium production by a factor of over 3-to-1. The first test, X-Ray, used a composite oralloy-plutonium core. Both Yoke and Zebra used an all oralloy core. The pits (tamper plus core) for all three devices weighed about the same. Other tested features included: varying the tamper thickness (which had been fixed at 7 cm in earlier devices) varying the amount of fissile material in the core. The effect of using a "minimum strength" polonium-beryllium Urchin neutron initiator. Content: The Greenhouse Test Series was conducted at Enewetok Atoll in April and May of 1951. It consisted of four relatively high yield tests (by the standards of the time) - Dog, Easy, George, and Item. Dog and Easy were proof tests of two new strategic bombs the Mk 6 and Mk 5 respectively. George and Item were the first true tests of thermonuclear fusion - the release of fusion energy from thermally excited nuclei. George was a research experiment that studied deuterium-fusion burning when heated by thermal radiation. Item was the first test of the principle of fusion boosting of fission devices. Castle Bravo: The first thermonuclear test yielded 15 MT, twice the predicted yield. Content: 1958: Operation Argus was the only clandestine test series in the 17-year history of atmospheric testing. It was secretly conducted in the South Atlantic, 1100 miles southwest of Cape town, South Africa. Argus consisted of three very high altitude test shots of the W-25 warhead to investigate the effects of nuclear explosions outside of the atmosphere - how the charged particles and radioactive isotopes released would interact with the Earth's magnetic field which could potentially interfere with radar tracking, communications, and the electronics of satellites and ballistic missiles. In a way, these tests could be considered a logical extension of the high altitude shots conducted within the atmosphere in Hardtack I, which detonated warheads at 85,250 feet (a 1.7 kt W-25 in the Yucca shot), 141,000 feet (a 3.8 Mt W-39 in the Orange shot), and 252,000 feet (also a 3.8 Mt W-39 in the Teak shot). Argus pushed nuclear tests still higher with effects tests at 100 miles (528,000 feet), 182 miles (961,000 feet), and 466 miles (2,460,000 feet). The motivation for this secret series was a theory developed by the brilliant but eccentric physicist Nicholas Christofilos at Lawrence Radiation Laboratory (LRL). He had predicted that injecting charged particles from nuclear explosions into near space to create artificial Van Allen belts would produce military significant effects. This series sought to prove (or disprove) his theory by actually creating such a belt. Operation Argus has been termed the "world's largest scientific experiment" encompassing as it did the space surrounding the entire Earth. The tests essentially confirmed his predictions. Content: 1971-underground-H-bomb test on Amchica Island,the largest underground nuclear test conducted by the United States, Project Cannikin was one of three underground nuclear tests performed at different places on this 43-mile long island in the Aleutian Chain. This $200 million 1971 test was performed to test an Anti-Ballistic Missile warhead, for a Spartan ABM missile. It consisted of a 5 megaton-yield thermonuclear bomb, detonated in a 50-foot diameter chamber, at the bottom of a 5,875-foot shaft. The island of Amchitka was a military outpost in WWII, and the air field and base camp from that facility were reused for the nuclear testing programm. Content: 1956: The lab tests centred on ICBM and SLBM missile warheads and high yield strategic bombs. The DOD conducted high altitude multi-megaton tests to study their usefulness for ABM (anti-ballistic missile) warheads, and discovered the high-altitude EMP (electromagnetic pulse) effect in the process. Effects tests of underwater explosions were also conducted. At least 14 mark-designated warheads were tested This series fired the largest tests since Ivy and Castle and led to the development and deployment of the largest U.S. weapon ever fielded, the 25 Mt Mk-41 bomb. The UCRL test of the W-47 Polaris warhead prototype was a major technological breakthrough that led to high yields in small light packages characteristic of all U.S. missile warheads today. The extensive test schedule required the use not only of both atolls (Bikini and Enewetak) but Johnston Island also. This series was the last to conduct atmospheric testing at Bikini and Enewetak atolls. Content: 30 kt, 2000ft depth. 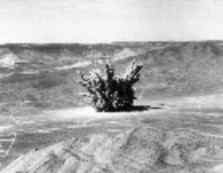 Operation Wigwam consisted of a single nuclear detonation, (both the operation and test are known as Wigwam), conducted 400-500 miles SW of San Diego, California(about 29 Deg N, 126 Deg W). It was a deep water test (the ocean is 16,000 feet deep at that point) to investigate the vulnerability of submarines to deep nuclear weapons, and the feasibility of using depth bombs in combat (there was considerable concern about problems with surface contamination). The test device was a B-7 (Mk-90) Betty depth bomb that was suspended by a 2000 ft cable from a barge. The dry weight of the bomb was 8250 lb, 5700 lb when submerged. 6800 personnel on 30 ships participated in Wigwam. A 6 mile tow-line connected the fleet tug, Tawasa and the shot barge. Suspended from this line at varying ditances from the barge were three "Squaws" - sub-scale submarine-like pressure hulls equipped with instruments and cameras. The ships conducting the test were 5 miles upwind from the barge, with the exception of the USS George Eastman (YAG-39) and USS Granville S. Hall (YAG-40). These two ships were equipped with heavy shielding and were stationed 5 miles downwind. Both ships were contaminated by the base surge, but due to the relatively dilute radioactivity (since the shot was at such a great depth) and the heavy shielding kept exposures within the Operation Wigwam dose limit of 3.9 rems. Nearly all personnel were issued film badges to measure radiation exposure, and some 10,000 badges were processed. Only 3 personnel were measured as having doses exceeding 0.5 rems. Long shot: This 1965 test consisted of an 85 kiloton yield bomb, detonated at the bottom of a 2,359-foot shaft. The test was one of several in a series, performed at various locations, to calibrate detection equipment for monitoring the Russian nuclear testing program. Content: All about civil defense, Testing of shelters, nuclear tests on houses and dummies at the Nevada Test Site. The goal of the test was to see how well houses, shelters, power lines, a radio tower, metal buildings, food, clothing, mannequins -- standing in for people -- and actual people would survive at various distances away from a nuclear blast. Content: 1955. This series of fourteen shots proof tested a broad variety of fission devices with low to moderate yields. As a group these devices combined several innovations - some previously tested, some introduced during this test series - to create a new pattern of fission device that would dominate the design of all later weapons. These devices used new compact, efficient, light weight spherical implosion systems; beryllium tampers; hollow cores; deuterium-tritium boosting; and the use of neutron pulse tubes as initiators to create light, compact, efficient, and reliable fission explosive systems. Several new primaries were tested for a new generation of lighter and more compact thermonuclear weapons to be fired in 1956 during Operation Redwing. Approximately 8000 DOD personnel participated in the Desert Rock VI exercise, which was intended to familiarize troops with the capabilities of nuclear weapons, and the conditions of atomic combat. Content: In late 1951 two test series were held together for the first time - Operation Buster (conducted by Los Alamos) and Operation Jangle (conducted by the DOD). 7800 DOD personnel participated in Buster-Jangle, 6500 of them troops who conducted field exercises in conjunction with the tests. These were the first such field exercises conducted in the United States proper. Tumbler-Snapper was focused on developing tactical nuclear weapons - both the weapons themselves and the knowledge and experience necessary for their operational use. The Desert Rock IV field exercise was conducted during Tumbler-Snapper, with 7350 out of 8700 DOD participants conducting maneuvers in conjunction with test shots Charlie, Dog, and George, and observing during Fox. Content: 1952: Enewetak-Atoll, Pazifik: At that time, the highest priority was placed on developing new and more potent strategic weapons - especially thermonuclear weapons (hydrogen bombs). No one had good ideas about how a practical thermonuclear weapon could be made. This raised new fears - that Truman's pronouncement may have surred Soviet thermonuclear efforts onward even faster, and that they might have hit upon concepts not yet known in the U.S. Consequently a fallback strategy was pursued - developing the highest yield fission bomb possible, a technical effort led by Theodore Taylor at Los Alamos. The conceptual breakthroughs of Stanslaw Ulam and Edward Teller the following January provided the needed insights to develop a thermonuclear device. By 1953 a pattern of test activity at the Nevada Proving Ground had emerged. Through the fifties, every year or (every other year if a pacific test series intervened) a series of several shots was fired at the NPG over a period of three or four months to address a wide variety of objectives. Upshot-Knothole was just such a scatter-shot effort. Technical information to assist in weapon design was obtained in several tests. Efforts to prepare the U.S. military for atomic combat continued with proof-tests of a number of new tactical weapons, including the first nuclear artillery shell. The tests provided additional experience and information for planning atomic combat operations. Important information was also obtained for civil defence efforts. Grable: A 280mm canon fired the first nuclear projectile. The yield was 15kt. After little boy this was only the second and also the last gun type device used. And critically important - Upshot-Knothole also tested the radiation implosion systems for the world's first deployable thermonuclear weapons, which would be proof-tested in Operation Castle the following year. An estimated 18,000 DOD personnel participated in observer programs, tactical manoeuvres, scientific studies, and support activities. Members of all four armed services participated in Exercise Desert Rock V.
This operation exposed exercise personnel to nuclear tests, and thus radiation, more aggressively than previous ones. Observation by troop formations was conducted at what was calculated to be the minimum safe separation distance, with many personnel being exposed to multiple tests. Under current occupational radiation exposure limits (0.3 rem/week and 5 rem/year) this would limit maximum exposures to 3.3 rems over the 11-week operation. Approximately three thousand soldiers reached or exceeded this limit, with 84 exceeding the annual limit (the highest recorded exposure was 26.6 rem). These exposures do not produce observable symptoms; they simply increase the lifetime risk of cancer a small amount. Content: 1956: Redwing was the second U.S. test series devoted primarily to proving thermonuclear designs of actual weapons. It centred on testing a broad variety of new innovative second generation designs. Redwing was conducted under an "energy budget" - the total explosive yield of the series, and the total fission yield were both assigned fixed limits for the whole series. The total yield limit was approximately 20 megatons. This series proof tested the Mk-28 warhead, a lightweight, small diameter thermonuclear design (20 inch diameter) dramatically smaller than most of the Castle designs; and "salted" or "dirty" (extremely high fall-out) weapons. Tests of low yield tactical fission weapons were also conducted, including some very small diameter, lightweight systems (diameters of 5, 8, and 11.6 inches). The first U.S. airdrop of a thermonuclear weapon was also conducted - partly as a weapons effects test, and partly as a political demonstration of the United States' capability to conduct nuclear attacks. Redwing was the second U.S. test series devoted primarily to proving thermonuclear designs of actual weapons Redwing centred on testing a broad variety of new innovative second generation designs. Redwing was conducted under an "energy budget" - the total explosive yield of the series, and the total fission yield were both assigned fixed limits for the whole series. The total yield limit was approximately 20 megatons. Operation Plumbbob was conducted at the Nevada Test Site (NTS) from May through October of 1957. It was the sixth test series at NTS and consisted of 29 tests. Six of these were safety tests, and two did not produce any nuclear yield. This series addressed several objectives, including tactical weapon proof tests, safety tests, and component and mock-up testing for thermonuclear systems to be detonated in Hardtack I, among other things. Priscilla, 700ft balloon shot with 37kt. A bank vault was among several other test objectives. Plumbbob released some 58,300 kilocuries of radio iodine (I-131) into the atmosphere. This was more than twice as much as any other continental test series. This produced total civilian radiation exposures amounting to 120 million person-rads of thyroid tissue exposure (about 32% of all exposure due to continental nuclear tests). Content: Hardtack II included 37 tests, the largest test series so far, exceeding the 35 tests of the just completed Hardtack I. 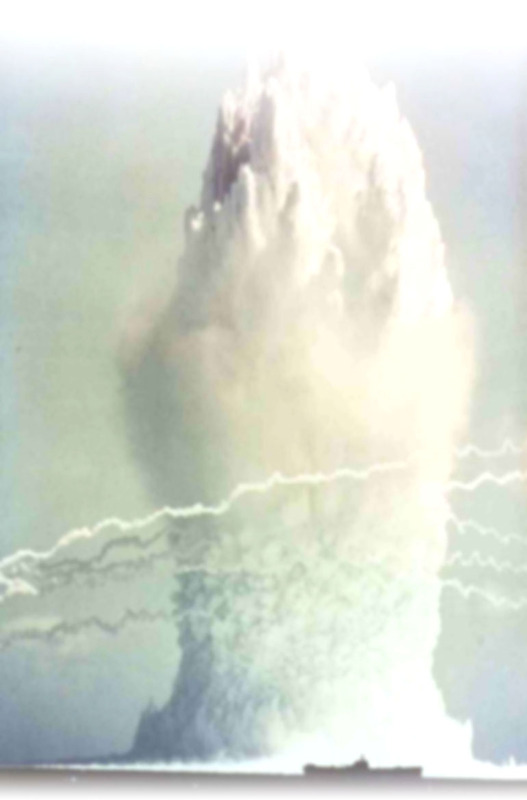 The world's first underground nuclear test had been fired in the previous NTS series (Plumbbob Rainier), and this series introduced underground testing as a routine procedure. The intention was to reduce the fallout effects of the testing, which were raising great concern, but the "underground" testing procedures were still relatively primitive. Many of these shots were conducted in "unstemmed" holes, that is, holes not back-filled and sealed prior to testing. These shots were called "roman candles" since the incandescent gas from the fireball was ejected as a jet from the mouth of the shaft. Obviously fallout containment was much less than perfect, but most of the fission product was nonetheless deposited in the shaft instead of escaping, and the radiation that did escape was not lofted so that it could not travel far downwind. Content: Operation Nougat included a total of 44 shots, including a Seismic Detection Program, 1961-Gnome, a 3-kiloton multipurpose test conducted in an underground salt bed deposit near Carlsbad, New Mexico. This series was conducted at the Nevada Test Site, which permitted rapid initiation of tests, but restricted them to low yields (and mostly underground test shots) due to fallout concerns. Although this was still the "era of atmospheric testing", Nougat was actually the first underground test series. Higher yield atmospheric tests followed seven months later with Operation Dominic in the Pacific. 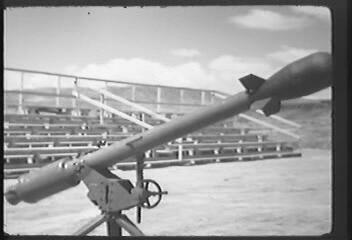 Nougat included a total of 44 shots, exceeding the previous record holder, Operation Hardtack II, with 37 tests. Nougat generally resembles Hardtack II in the nature of testing that was conducted. Low yield tactical devices were extensively tested. Thermonuclear primaries and radiation implosion mock-ups were tested. Much attention was paid to simultaneously achieving desired performance and one-point safety in "sealed pit" fission devices, some designs requiring numerous shots. Since all the tests were fired underground, and only a few of them produced true blast craters (i.e. not subsidence craters caused by blast cavity collapse), there are few pictures available of these tests. This operation exposed exercise personnel to nuclear tests, and thus radiation, more aggressively than previous ones. Observation by troop formations were conducted at what was calculated to be the minimum safe separation distance, with many personnel being exposed to multiple tests. Under current occupational radiation exposure limits (0.3 rem/week and 5 rem/year) this would limit maximum exposures to 3.3 rems over the 11-week operation. Approximately three thousand soldiers reached or exceeded this limit, with 84 exceeding the annual limit (the highest recorded exposure was 26.6 rem). These exposures do not produce observable symptoms; they simply increase the lifetime risk of cancer a small amount. Content: Operation Plowshare was the overall American term for the development of techniques to use nuclear explosives for peaceful construction purposes. Proposed uses included widening the Panama Canal, constructing a new waterway through Nicaragua, cutting paths through mountainous areas for highways, and mining. More speculative uses included setting nuclear weapons off in underground caverns with the hope of creating steam which could then be used to generate electricity (tests indicated that the steam would be too radioactive for safe use, however). The plowshares operations which was closes to being carried out was the the planned Chariot blast which would use hydrogen bombs to create an artificial harbor at Cape Thompson, Alaska. It was never carried out due to concerns for the native populations and the fact that there little potential use for the harbor which would justify its risk and expense. The use of nuclear weapons for civilian engineering purposes has never been applied in the United States, but it has been tested. These twenty-eight shots were conducted in conjunction with other, weapons-related, test series. Content: The Swordfish event was a test of the ASROC anti-submarine defense system. Also part of this shot was extensive underwater weapons effects experiments. This was the last underwater nuclear test conducted by the United States. Asroc was a ship launched rocket. Near the target it was slowed down by a parachute and dropped into the water. The rocket provided an effective weapon against the extended capabilities of modern submarines. Content: nuclear effects at sea: what effects can a nuclear attack have on a ships, on its structure, its weapons and electronic. Fighting ability, radiation sickness, hull rupture, blast shock to the superstructure, collapsing deck structures, blast insury to the crew because of the short rise time of the shock front. Blast on vulnerable flightst decks. Thermal radiation preceding the shock wave. Effect of thermal radiation on exposed personal. The rad is concentrated on a millisecond. Retina burnig can be as far as the horizon . Nuclear radiation is in some ways the most dangerous thread. The ionising radiation leads to radiation sickness depending on the radiation dose.shielding for radiation : shielding of thermal radiation. Only shielding in compartments and spacings below the waterline can be considered to be safe for y- and neutron radiation.. The effect of nuclear radiation on electronics can be serious. Fission droplets from an underwater explosion fall back on the surface. Numerous atmospheric tests, many at high yield, were of course on the drawing board at the weapons labs, some carried over from planning for previous test series. Official U.S. action on convening its own atmospheric series did not begin until 10 October 1961 when President Kennedy approved planning for one. Final approval was given on 2 March 1962, 7 weeks in advance of the first planned test. Over 28000 man were involved.military and civilian. 200000 tons of material were shipped. Content: A comprehensive Summary of all US atmospheric tests. Content: 1957, Operation Plumbbob was conducted at the Nevada Test Site (NTS) from May through October of 1957. It was the sixth test series at NTS and consisted of 29 tests. Six of these were safety tests, and two did not produce any nuclear yield. This series addressed several objectives, including tactical weapon proof tests, safety tests, and component and mockup testing for thermonuclear systems to be detonated in Hardtack I, among other things. Content: Shows preparation of Able shot and the famous Baker shot.